600 metres from the train station, with links to Cambridge, London and Stansted Airport, this family-run Victorian guest house offers bed and breakfast accommodation and good evening meals. The Grange Guest House is a family-run house and guests are welcome to take beverages from the kitchen: tea, coffee and soft drinks are free of charge. You can also use the sitting room where there is a log fire in winter. The garden is ideal for summer. The Grange is close to the town centre, with its choice of restaurants and pubs. The nearby train station offers direct links to Stansted Airport (10 minutes), London (40 minutes) and Cambridge (40 minutes). In a quiet location, just outside Bishop's Stortford town centre, this modern accommodation is within walking distance of the train station, shops, leisure centre, river, and nightlife. The charming, family-run Jolly Brewers offers comfortable rooms in a separate building next to the pub. Built in 2007 to a very high standard, the twin/double rooms have en suite toilets, washbasins and showers, or en suite bathroom. All have TV, tea/coffee and internet access. Jolly Brewers Travel Lodge is within a 10-minute drive of London Stansted Airport, but far enough away from the flight path. Guests can park cars outside their room. Special arrangements can be made on request, if you want to leave your car park after check-out. Woodlands Lodge is 5 minutes' from Stansted Airport and offers free parking and a free airport transfer service. Rooms have en suite bathrooms, satellite TV and free Wi-Fi. Under new management, this traditional 3-star (self accredited) B&B is opposite Bishop's Stortford Golf Club. It is close to the train station, the town centre, and the shops, bars and restaurants of Bishop's Stortford. Each room has a multi-channel TV with a complete Sky package. 24-hour check-in/check-out is available. Continental breakfasts are available. Birchanger Green 24-hour Welcome Break service area is a 5-minute walk away. It has fast-food outlets, shops and tourist information. Bed and breakfast in Bishop's Stortford. Self catering apartments. AA rated 4 diamonds. Peaceful situation. 10 minutes from Stansted airport and close to town for trains to London and Cambridge. Bed and breakfast in Bishop's Stortford. A detached home offering comfortable accommodation located a short drive from Stansted Airport, M11 (J8). We are situated a short distance from Bishops Stortford town centre, bus & mainline railway station which offers direct lines to London, Cambridge and Stansted Airport. Long/short term car parking available (by prior arrangement). Bed and breakfast in Bishop's Stortford. Bed & Breakfast in Bishops Stortford ideally located within a few minutes walk to Bishop's Stortford town centre, bus and mainline railway station. Stansted airport and M11 (J8) are a few minutes by car. 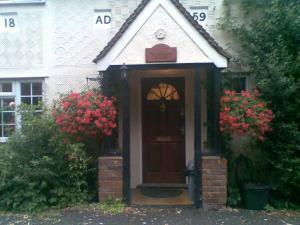 For bed and breakfast accommodation in other areas near to Bishop's Stortford, Hertfordshire see B&B in Great Dunmow & B&B in Harlow.